April Fool’s Day has huge protentional to be one of the silliest, most hilarious days of the year. It presents itself as an opportunity to have some childish fun with your kids and get maximum laughs with minimum effort. April Fool’s day allows us to kick back and enjoy some light-hearted fun with our families. There are several family-friendly April Fool ideas out there that are sure to encourage all the laughs. Go through the house and change all the clocks. Whether that means you change them all to an hour ahead or push them back an hour, see if anyone notices. This one takes some planning ahead but packs a huge punch of laughter. Fill a bowl with cereal and milk and place it in the freezer overnight. The next morning feed it to your kids and watch their puzzled expressions as they attempt to dig in. The look on your family’s face when they discover this one is worth a picture. When your children or significant other comes home, tell them that you made them some brownies. They will be so excited as they head off to the kitchen to indulge. When they find the baking sheet full of “brown E’s” (brown construction paper cut into letter E’s), they are sure to laugh. Fill drinking glasses with flavored gelatin and tell the kids it’s their drink for dinner. Place a straw in the cup before you allow it to firm up in the fridge. They will try to take a sip and when they can’t get the juice out of the straw, they will be shocked. Stick googly eyes to all their lunch items. When they get to school or work and open their lunch boxes to find their lunches staring back at them, they are sure to be surprised. Remove all the batteries from all the remotes in the house and watch your family try to watch TV. Get small individual bags of cheese puffs, open them up and replace the cheese puffs with carrots. Then, glue the bag back closed and offer your little ones a snack. Place a few small drops of food coloring in the bottom of a bowl and cover with their cereal. Have them pour their own milk in and watch their expressions as the milk changes color. 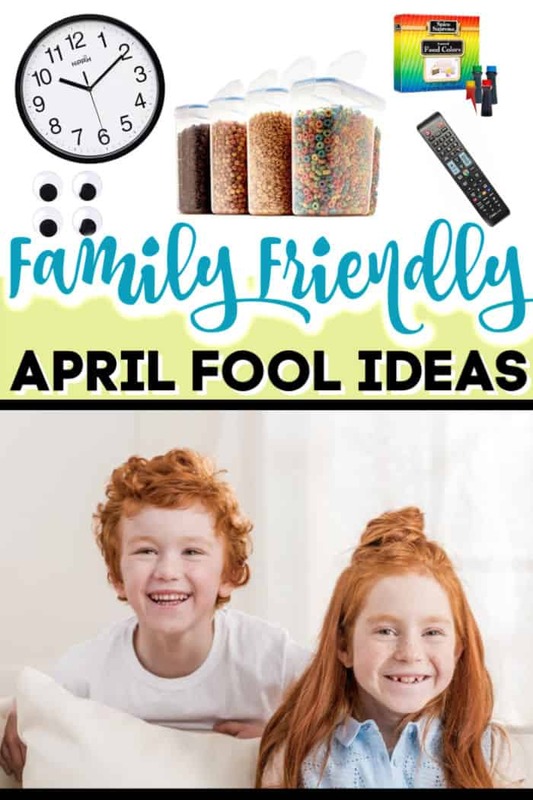 There are several family-friendly April Fool ideas out there that are sure to make your entire family laugh in delight. Just get creative and plan ahead.